Boxcutters, Strainer, Tablespoons, Flûte, Cup. Recipe can easily be increased to serve a crowd. Just make sure you have equal amounts of Cranberries and Pears plus enough fresh Rosemary Sprigs for each glass. In a Small Saucepan, cook Cranberries and Pears over low heat with the lid on. Stir every five minutes or so and mash up the berries and pear as much as possible. Cook until fruit is extremely soft, about 15-20 minutes. Press fruit through a fine mesh sieve and discard solids. Chill until ready to use. 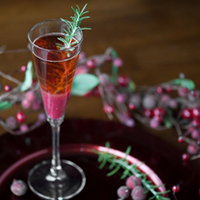 To serve, divide cranberry pear puree evenly among 4 Flûte Glasses, taking care not to get it on the sides of the glasses. Pour in chilled Moscato. Add a sprig of rosemary to each glass. Serve immediately.